We use a standard method fully described at the web site vera-eisenmann.com. 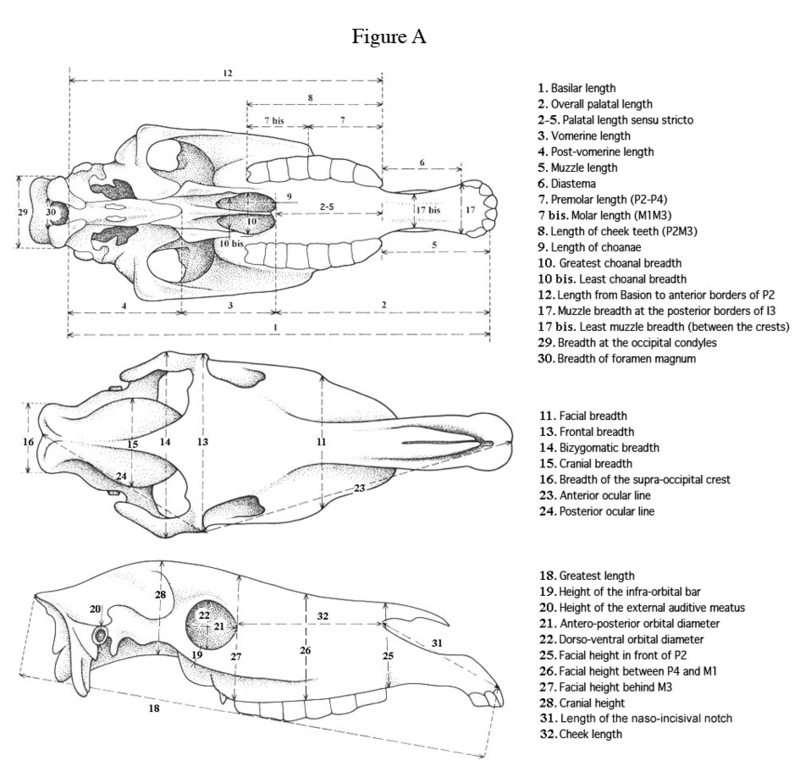 The cranial measurements are illustrated below (Fig.A). For the limb bones in this article we use only maximal lengths. They provide rapid and easy comparisons, both of size and shape, for a single bone or a group of bones. The reference is provided by a single bone (or a group of bones), or means of a bone sample, the dimensions of which are converted into decimal logarithms. By convention, logarithms of these dimensions are placed on the "0" line of the graph. We use an extant equid, E. hemionus onager, as reference. Dimensions of the material under study are also converted into decimal logarithms. Arithmetic differences between the reference logarithms and the logarithms of the studied dimensions are placed above the "0" line if they are positive (larger dimensions), or below if they are negative (smaller dimensions). In such a logarithmic diagram, proportions remain unchanged whatever the absolute dimensions: diagrams of two bones differing by their size but identical by their proportions will appear one above the other but on parallel lines. The diagram interpretation is easier when couples of dimensions describing main proportions are placed side by side. For instance, "gracile-robust" proportions appear immediately when "widths" are placed beside "lengths". It may also be convenient to group the dimensions of anatomical parts (diaphysis, proximal end, distal end). When data are often missing for some dimensions (for example when a particular part of the bone is often badly preserved), we use to placing them at the beginning or at the end of the diagram. Raw data and statistics on crania and mandibles are in Tables 1 and 2. Raw data on cheek teeth are in Tables 3 and 4. A detailed Simpson’s diagram of Arab and Pony crania (Fig. B) shows, in addition to Fig.3, one important point: in the Arab the Vomer-Basion distance  is longer. Moreover the choanae  are shorter. Raw data are in Tables 5-11.